Shower tub combination - The most common residential configuration in today's home is the shower tub combination. It is characterized by a standard elongated tub for prone bathing, in addition to, having wall mounted nozzles for stand-up shower purposes. These designs are especially popular if you have limited space. Stand alone shower - For those homes where space is not an issue, a stand-alone shower can be just the ticket. With framed and frameless designs that may or may not use a swinging door, stand-alone showers can be outfitted to having multiple nozzles delivering water flow from a variety of angles. Separate tub and shower installations provide greater flexibility for your bathing needs. Bathtubs - Bathtubs in the western nations are distinct in that the bather lies down in a prone position for bathing purposes. These types of baths are typically shallow and long and can either be free-standing, like those pedestal and claw-footed designs of the 19th century, or the more traditional molded units that utilize walls of the bathroom for support. Hot tubs - Hot tubs are generally large home-made or manufactured tubs full of heated water and used for soaking, relaxation or hydrotherapy. In most cases, they possess water jets that produce pulsating water movement for massage purposes. Most hot tubs are located outdoors, and are often sheltered for protection from the elements, as well as for privacy. Whirlpool tubs - Whirlpool tubs were popularized in the 1960s. Air bubbles are introduced into the water nozzles via an air-bleed pump and have been generically referred to as a "jacuzzi", since it was developed and introduced by the manufacturer Jacuzzi , as the "Spa Whirlpool" in 1968. Walk-in tubs - Walk-in bathtubs are specially equipped bathtubs that assist those with limited mobility, such as the elderly or the disabled. They either have an inward or outward opening self-sealing door. Many walk-in bathtubs are equipped for hydrotherapy and/or whirlpool features, internal safety grab bars, anti-slip floors and seats, and handheld showerheads that can also be wall-mounted to enable one to take a standing shower. Nozzles - With the newer designs in showers and tubs there are also innovations in the water delivery system. Some nozzles or showerheads contain modern sensor-operated column showers that distribute the water over a large solid angle. This utilizes less water to wet the same area and is more eco-friendly. 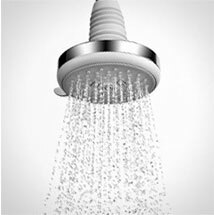 Low flow shower heads can use water more efficiently by aerating the water stream, while some shower heads can be adjusted to spray different patterns of water. Benjamin Franklin Plumbing licensed specialists are masters of all shower drain repairs, bathtub drain repairs, water pressure issues, installations and replacements. We are the experts to call for your bathroom plumbing solutions.